It was the biggest football game of his life and Stewart (Larry the Cucumber) had a chance to win it all. Injured in one bad play, his hopes of playing in the Salad Bowl – and living a life of fame and fortune – are dashed forever. Years later, silly-but-sweet Stewart loves his family, friends and job at the toy train factory, but still wonders what if things had been different. When he meets a mysterious train conductor who can turn back time, Stewart gets a chance to have the life he always wanted. Will he finally find all he's been looking for? And what does this mean for those he loves most? Find out in this story of wonder that's a lesson in being content. Includes an original song by Steven Curtis Chapman, whose daughter Stevey Joy voices "Emma the Rhubarb." 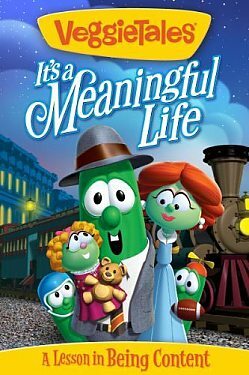 VeggieTales brings 3 classic stories of "true" love together.